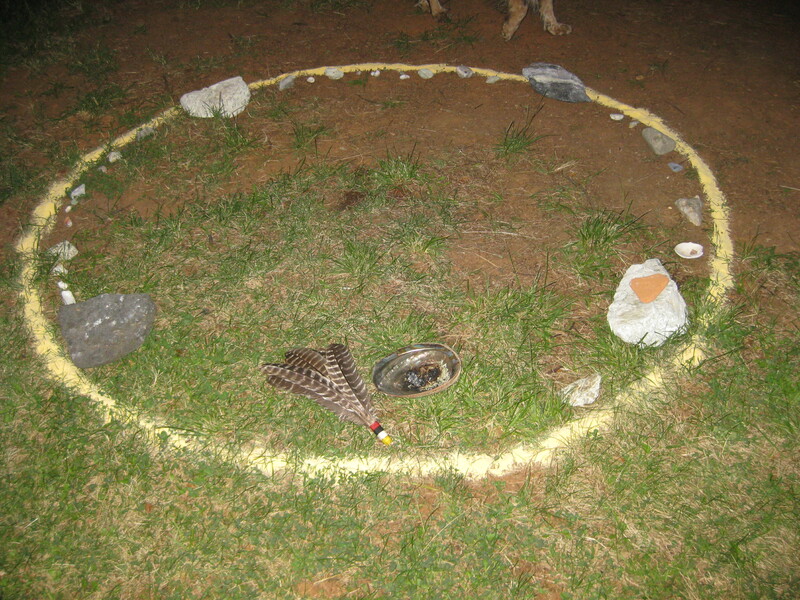 The stones are placed in a circle. All are Catalina stones and I recognize the smooth green soapstone, the enduring white of the quartz, and my favorite, the red and black garnet. It is important that the stones are here, placed alongside the cornmeal, for they represent a part of me. They are a part of me. These stones, like the land from which they came, hold four generations of memories, stories, and dreams. For me this includes memories of long hikes on the wild backside, wet wintery days and Levis covered with mud. They stir dreams of waking to the sunrise on empty beaches with no tent, pad, or pillow; just the soft, warm sand and a thin sleeping bag to ease the evening chill. And many memories of my father and his small Cessna, gliding through cumulous cloud caves with the blue, sun sparkled ocean below. As I look down at the stones, memories flood me – too many memories –and so I am grateful that the stones can hold them in place. But we are in the western foothills of the Sierra, someplace near Grass Valley, and not on Catalina Island. This is a landscape that is not mine but is slowly reaching in and weaving itself around my arteries, like a vine working its way up the rain gutters of a new building. This is the place we have chosen to wed. My story is being woven into his and his into mine. This place, where we stand, also holds memories of four generations, of life-long friends, many loves and many losses, cherished trees that have fallen during heavy winter storms and new promising sprouts that show up in spring. The stories are palpable here. They live in this land. What is this thing that we call “ceremony”? How could this simple act bind two very separate lives, collective memories, and entire histories? 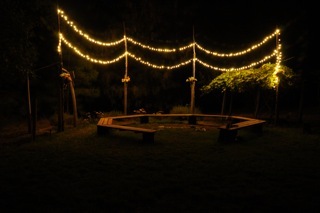 We created this ceremony, we planned it, but once it got started everyone present knew that it took on a life of its own. For the last fifteen years, I’ve been creating and sitting in ceremony as part of my involvement with the School of Lost Borders. We have a saying: “Trust the ceremony”, which essentially means that we can depend on that which is much greater than ourselves – greater than our individual selves – to bring about the changes, the bonds, and new openings that we seek. It is true. I’ve seen it happen over and over again. Even when it all feels so mundane, or when personalities are out of sync, or the weather is troublesome, the ceremony always pulls through. I’m not talking about ceremony as verbatim ritual. Many of the so-called ceremonies I have attended throughout my life have been nothing more than a collection of repetitious acts, and as meaningful as reciting the phone book. But when people come together with a clear intention, complete presence, and open hearts, something remarkable occurs. A space is created – a threshold – where old perceptions are suspended, making room for the unexpected new. “The purpose of a ceremony is to integrate: to fuse the individual with his or her fellows, the community of people with that of the other kingdoms, and this larger communal group with the worlds beyond this one. A raising or expansion of individual consciousness naturally accompanies this process. The person sheds the isolated, individual personality and is restored to conscious harmony with the universe”. – The Sacred Hoop. 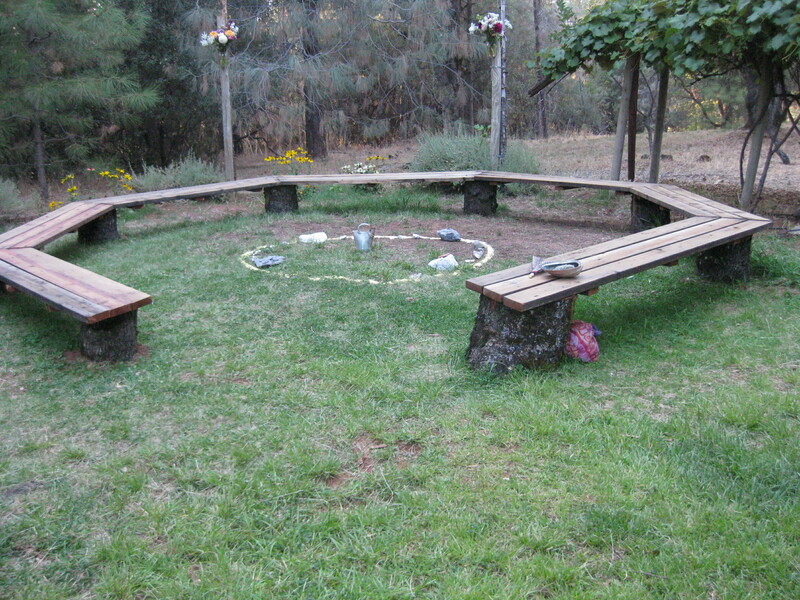 Ceremony marries all the disconnected pieces and unites them. Thus, there are no separations in ceremony, no rigid categorizations of superior and lesser, no hierarchy between people, or between humans and the rest of creation. In a world that has been compartmentalized by the compulsive need to exert power and control, ceremony is that which brings all things, human and non-human, back together in a web of inter-relatedness. In a word, ceremony brings about wholeness. And, wholeness is not to be confused with monotheism. Wholeness does not support “there is one truth, the only truth” absolutist thinking. Rather, wholeness suggests continuity and belonging. As Gunn Allen implies, wholeness means to be fused with our community, with our environments, and with the worlds beyond our own (notice that she uses “worlds” in the plural). When these many layers of existence are aligned there are no discarded pieces – whether the pieces are perceived to exist inside or outside of our skin – and each piece provides meaning in relation to the others. When there is a drought, some may say, it is because we are not treating the land with respect. Or perhaps, we are not in right relationship with our neighbors or with ourselves. As Jung mentions in his retelling of the rain maker story, maybe we are not in Tao. Whichever tradition one functions within – modern, tribal, Eastern or Western – disease is not just an individual problem. It is relational on every level. And ceremony is the only cure I know for the disease of separation. It is no wonder that when in ceremony, people are more emotional, more expressive, more creative, and more likely to show their wild and unruly selves. In a culture of intolerance, these are the parts that are most often left out, pushed down, and exiled. In the spirit of ceremony nothing is out of place. And that, which was once harmful and self-destructive turns belly up and morphs into a great gift – a new delight, as Rumi calls it. For native peoples, ceremony is a co-creative act writes Paula Gunn Allen, “Christians believe that God is separate from humanity and does as he wishes without the creative assistance of any of his creatures, while the non-Christian tribal person assumes a place in creation that is dynamic, creative, and responsive”. Thus, ceremony is not stagnate, nor bound by a fixed set of meaningless rules. It is creative; and it is creation. No longer separate from the sun, moon, stars, trees, animals, and stones, we become participants in creation. Without ceremony, it is feasible to think that the world may just come to an end. Yet, there is one constant in ceremony, at least that I know of, which is love. Not gushy, romantic love (yet, there is room for that too), but the love that extends us beyond ourselves. Even when it feels impossible to love oneself or the other, it is easy to love the ceremony. And that love reaches out, like the branches of a tree and wraps itself around the circle. Through the love of ceremony, we are able to love even ourselves. And so I say the words, “I do”. They are not just ghost words floating around in a non-material realm. These words are the act itself. “I do”. It is so. These lives, these worlds, are brought together though ceremony; though love. *This piece is dedicated to Wayne Olts and Joseph Lazenka and to those from Lost Borders and “The Ranch” who helped to make our wedding ceremony so meaningful and real. And, of course, to my man, Joe, whose love cracked me open in ways I never knew possible, and let the sun come streaming in.